A very large part of being a successful fly fisher in Puget Sound is being prepared with the right equipment. Rods, reels, and most importantly lines play a huge part in successfully targeting fish in Puget Sound. Whether you are fishing from the beach, or from a skiff, having the right equipment can make or break a day. There is nothing more frustrating than being held back from catching fish because your gear is not capable, or you are fishing the wrong line for the situation. When targeting sea run cutthroat here in Puget Sound we strongly believe that a saltwater safe, 9′ 6 wt rod is the ideal tool. Is it possible to catch these fish with lighter gear? Absolutely! But is a lighter rod the best tool for the job? Not very often. Wind and heavy flies are two constants of saltwater fly fishing. The days when there is little to no wind are few and far between. 10 knot winds are almost a constant out there, and often times the wind will be in the 15-20 knot range. If you’re content not fishing on these windier days then a 4 or 5 wt rod is just fine. We here at South Sound Skiffs, however, are addicted to this fishing and are not at all interested in going home early because it got a little breezy. Casting heavy flies on lighter rods is also just not very fun or practical. Sure, you don’t always need to cast heavy flies, but there are tons of times when a nice heavy clouser is the ticket to getting hookups with saltwater fish. Again these are not situations we are willing to miss out on simply because we want to cast a lighter rod. Other factors that come into play when selecting a rod to use is casting distance, and encounters with larger fish. It is not at all uncommon to hook into a nice sized Chinook while targeting sea run cutthroat on the fly, and having a rod with enough backbone to be able to slow these fish, which are commonly found in the 4-10 lb range, is important. Nothing like hooking the salmon of the lifetime but being unable to slow it because the rod wasn’t capable. Casting distance is also at times extremely important, and can often be the difference between an OK day and a great day. Because of these factors we strongly believe that a fast action, graphite, 9′ 6 wt rod is the ideal tool and this is what we keep in the boats at all times. There are many, many great saltwater fly rods but we are big fans of the Echo 3S saltwater fly rods. These are powerful casting rods with a lot of feel, plenty of backbone to fight larger fish, and hold up well to the rigors of fishing the salt. 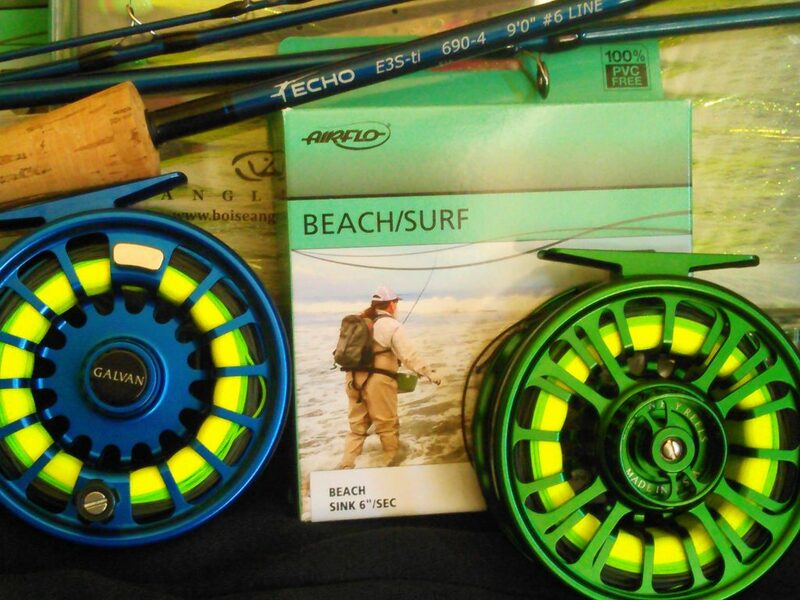 While reel selection is not a huge deal most of the time, selecting a reel that is saltwater safe and will hold up to the abuse of fishing in the saltwater is important. As is having a reel with a nice smooth drag. 99.9 % of all sea run cutthroat hooked never actually make it onto the reel. Considering that a 20″ sea run cutthroat is a true trophy, the chances of hooking a fish that is going to earn the reel and make screaming runs is low. But as already mentioned, there is a lot of by-catch when targeting these fish and hooking one of the 5 species of Pacific Salmon is always a possibility, as is the potential of hooking a steelhead. When these situations arise you will be thankful to have a reel with a strong drag that makes landing such a fish a possibility. There are a ton of great reels out there that are perfect for this type of fishing, but we prefer the Galvan Torque reels. Silky smooth drag, strong build, and great customer service. What more could one need from a saltwater reel? Oh ya, they look great too! Perhaps the most important factor in saltwater fly fishing in Puget Sound is selecting the right line/s. More than any other single piece of gear, the right line can truly make or break a saltwater fly fishing trip. There is a ton of different line options available, but we find ourselves fishing integrated shooting heads the most. A shooting head line is designed to be cast long distances with minimal false casting. This is extremely important because the you’re not going to catch fish with your fly in the air. Keeping your fly in the water longer is a crucial element of saltwater fly fishing in Puget Sound, and fishing an integrated shooting head line allows for a bare minimum of false casting. The ability to make a single back cast with a haul and then shoot long distances is crucial when you spot that fish jump near shore. If you spend 30 seconds false casting there is a very good chance that fish will be long gone by the time your fly actually lands. Also, minimizing false casting will save wear and tear on your arm/shoulder over the course of a day where several hundred casts are made. Simply put, integrated shooting heads are absolutely perfect for this style of fishing. Sink rate is also another extremely important factor, and this is an area where having several lines available can be important. When fishing from a boat in the south sound, where large tidal exchanges are the norm, having a line capable of getting the fly down to the fish can be extremely important. For that reason we find ourselves fishing type 6 lines more than any other. Fishing a line with a lesser sink rate can certainly catch fish in many situations, but it becomes a hindrance when needing to get down 10′ in a heavy current. That said there are times when a floating line and a long leader is needed, times when an intermediate line is the right tool etc. Having access to a variety of these lines while out in a boat can be a major advantage as you can quickly switch to the right line for the situation at hand. We recently experienced a situation where fish were crashing bait in a foot or so of water, and the type 6 lines were just too much. By quickly switching to an intermediate line with a clear head we were able to catch these shallow water fish. The lines that we fish on our boats are made by Airflo. The Beach Line, and the 40+ line are both excellent integrated shooting heads that come in a variety of sink rates from floating all the way to type 7. These are excellent casting and fishing lines and they hold up extremely well to the abuse given to them by the unforgiving waters of Puget Sound. Plenty of fish are caught in Puget Sound each and every year on soft, freshwater rods, traditional full head floating lines, and a variety of reels, but if one truly wishes to have sustained success in this fishery then they would be wise to tailor their gear towards that end. By equipping yourself with gear that is designed for this type of fishing you will find yourself with your fly in the water longer, get your fly down to the zone where the fish are at any given time, and be able to actually fight and land larger fish when hooked. You will also be able to stay out on the water longer, as you won’t have to abandon fishing plans when the wind picks up. These simple factors can really help up your success rate when fly fishing the waters of Puget Sound. Bart is a knowledgeable and patient guide and has the skills and boating expertise to put me on fish all day. I am in the fishing industry and have been angling rivers lakes and the salt my entire life. His fishing program is a refreshing and new experience which has opened new doors for me as an angler. Bart knows his stuff and was able to set me up on many productive drifts and helped me to hook numerous fish as well as multiple species. He showed me an awesome fishery, offered solid companionship and taught me a few things as well! I look forward to more days of angling with him.